Studying the chemistry and physics of disordered materials. Greetings! We are diverse materials science lab at Dalhousie University. The lab director, Professor Josef Zwanziger, holds appointments in both the Department of Chemistry and the Department of Physics and Atmospheric Sciences, and is currently the Interim Director of that Institute for Research in Materials. Stress on glass, both compressive and tensile, leads to birefringence. Such an effect is shown in the accompanying picture, showing several glass samples undergoing compressive stress and viewed through cross polars. We are working on the problem of designing zero stress optic glasses without the use of lead or other environmentally harmful additives, and have made much progress in this area. Another project in glass science involves study of glass structure as it relates to the mechanism of glass devitrification. Recently we have become interested in the problem of producing stronger glass. This is an important area because current glass making technology is very energy intensive, and production is expected to rise world-wide due in part to the demands of solar power production. Stronger glass could require that less be melted, resulting in an overall environmental savings. We are studying the structural and atomic bonding problems surrounding glass stiffness and strength, with a variety of microscopic and macroscopic methods. We have a significant effort in computational and theoretical studies of solids. The picture shows the electron density in the Mott-Hubbard insulator LaTiO3, for which we could reproduce the nuclear quadrupole resonance spectra and study the orbital ordering. We are a materials chemistry and physics research laboratory, operating at Dalhousie University, in Halifax, Nova Scotia,Canada. We combine experiment and theory to study the structure and propertiesof materials, especially for applications in optics. Joe wins the 2019 Varshneya Frontiers in Glass Science award! Excellent papers from Tsanka Todorova on elastic response and ordering in cermets. 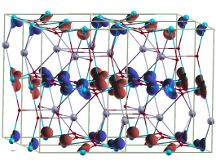 Beautiful computational work by Alex Paterson on residual stress in a ferroelectric glass ceramic. Joe wins the 2018 E. W. R. Steacie Award of the Chemical Institute of Canada! Mounesha Garaga's work on TeO2 glass is out. Emma Power and Alex Paterson's work on bismuth zero stress-optic glass is published. Joe's Tier 1 Canada Research Chair has been renewed for a 3rd term! Mounesha and Alex are off to Hawaii! Their talks have been acceptedfor the GOMD-PACRIM meetingin May 2017 in Waikoloa. Joe wins the 2017 John C. Polanyi Award of the Chemical Institute of Canada!